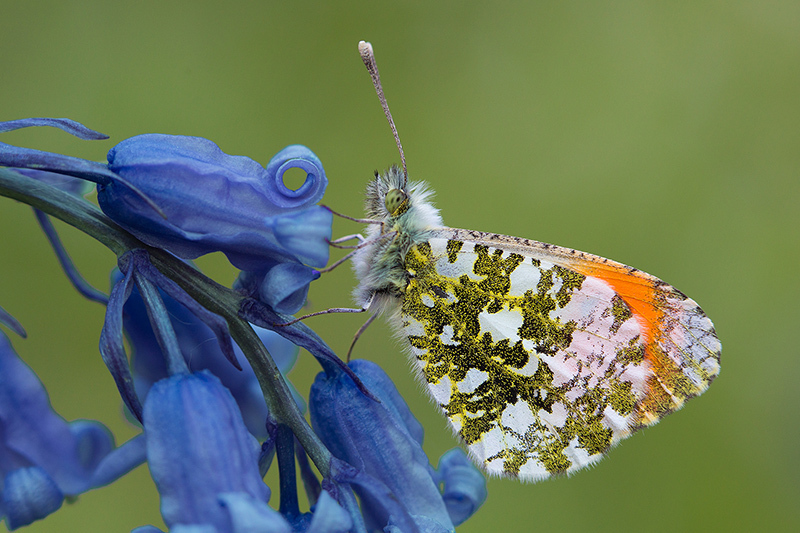 With their cryptically coloured underwings and startling upper wings, orange tips are one of my favourite butterflies. Their larval foodplant, cuckoo flower, grows in a meadow adjacent to an ancient woodland near my home so I looked for the butterflies on a sunny afternoon. A strong colony was flitting around the sunny rides and open areas of the wood. Returning in the evening just before sunset, a careful search revealed an orange tip roosting for the night. By photographing it on a bluebell, my image achieves a pleasing colour balance and conveys the spring flight period of this dainty butterfly. I mounted the camera exactly parallel to the plane of its wings so they would be sharp with an aperture of F/5.6 and cleared away distractions from the background. Gently stroking the resting butterfly with a fine paintbrush persuaded it to reveal its fiery upper wings for a few seconds while I made the image.